Each year, the fifth grade students who participate in the DARE program write essays on what they learned through the year. Pictured are essay winners from Beale Elementary last year, Delaney Pearson and Allizabeth Kauff, sharing their essays before their fellow DARE graduates and Lt. Troy Stewart. POINT PLEASANT — This coming Monday, a charity bingo night will be held in support of the county’s DARE program for the youth. The event will be held at the Point Pleasant Moose Lodge 731. The doors of the lodge will open at 5 p.m., with the games starting at 7 p.m. Admission is free and this event is open to the public. An individual must at least be 18 years old to play bingo, but all ages are welcome to attend. The games offered for the evening are four coverall games which cost $5 a piece and 10 regular games which cost $1 a piece. Concessions will be available for purchase and there will be a cash drawing. Also, t-shirts will be offered as prizes. All of the proceeds made throughout the evening, including the funds made from the concessions and the cash drawing, will be going to the county’s DARE program. Most of what is done for the DARE program is done through donation and the majority of the proceeds from this event will be going towards the DARE graduation. The graduation will be held at the Mason County Board of Education office this spring and the day is a reward for the children in the program, a bounce house is provided on site of the graduation each year as well as snow cones and other fun activities. At last year’s graduation, over 300 fifth grade students graduated from the DARE program which is under the direction of Lt. Troy Stewart of the Mason County Sheriff’s Department. DARE stands for Drug Abuse Resistance Education and includes a variety of educational opportunities for students to learn about the dangers of illegal drugs as well as alcohol and tobacco use, and dealing with peer pressure, among other topics. The program attempts to provide students with the tools to make smart decisions in life. Each year, the students are asked to write essays on what they learned through the year during their participation in the DARE program. Two winners are selected from each school’s fifth grade classroom and the winners are asked to read their essays aloud when receiving their prizes and certificates. The lodge has been holding a special charity bingo night on the second Monday of each month for local organizations. In March, the bingo night will be in support of the Mason County Homeless Shelter. The staff at the homeless shelter are in the works of raising funds for the purchase of land for a new shelter. Beth Sergent contributed to this article. 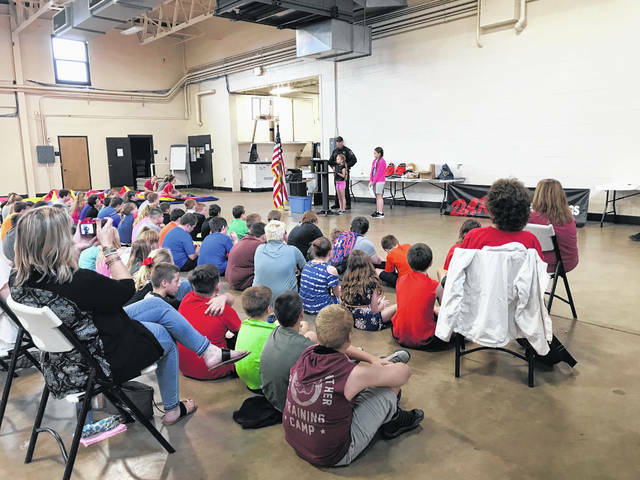 https://www.mydailyregister.com/wp-content/uploads/sites/24/2019/02/web1_6.9-DARE.jpgEach year, the fifth grade students who participate in the DARE program write essays on what they learned through the year. Pictured are essay winners from Beale Elementary last year, Delaney Pearson and Allizabeth Kauff, sharing their essays before their fellow DARE graduates and Lt. Troy Stewart.